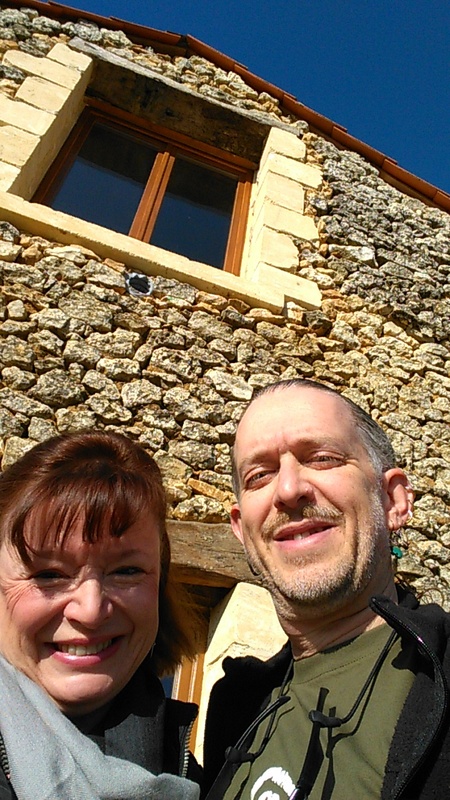 We’ve been married over 15 years and moved here in 2014, after coming to the area for the best part of a decade on holiday in search of an “adventure” and to escape the Big Smoke. It was the best decision we ever made! We live here permanently and would never contemplate going back to the UK: it’s great to visit, but for us, this is home. We went from living and working in London to converting our barn and running our own business – we love every day. The climate, the place, the free time to do things we’ve been planning to do all along. Debra has many craft projects (large and small) planned and Dean writes fiction and runs a small business helping people publish their books, now in it’s 5th year of operation. The property is set on the top of a hill over looking a valley and the village of Saint-Laurent-des-Bâtons. It’s incredibly peaceful and beautiful, yet just minutes away from all the most popular tourist attractions. It’s also within easy reach of the major towns – the regional capital Perigueux, Sarlat and Bergerac and very handy for the airport at Bergerac. Saint-Laurent-des-Bâtons is an agricultural village with a very small population that swells when several annual events take place. We wanted the challenge of renovating a property and that’s what we got. It’s been a steep learning curve, but great fun at the same time. We hope you enjoy the results! Peace, tranquillity, solitude: just a few things that make it a great destination. With easy access to the sights and sounds of the Dordogne, we think our luxury gite is the perfect place for your holiday. With a fully-equipped kitchen, plenty of bathrooms and very comfortable beds, this is the place for you. We provide a very personal service, if you want it, recommending and booking restaurants, suggesting places to visit, helping you to make the most of your stay. We wouldn’t be in France without the help and advice of our good friends, Alex and Alison Wright, with whom we stayed for a large part of the last decade. They have gites which sleep from 2 to 12 and you’ll find them at www.giteswithapool.com.